Alginates are cell-wall constituents of brown algae (Phaeophyceae). 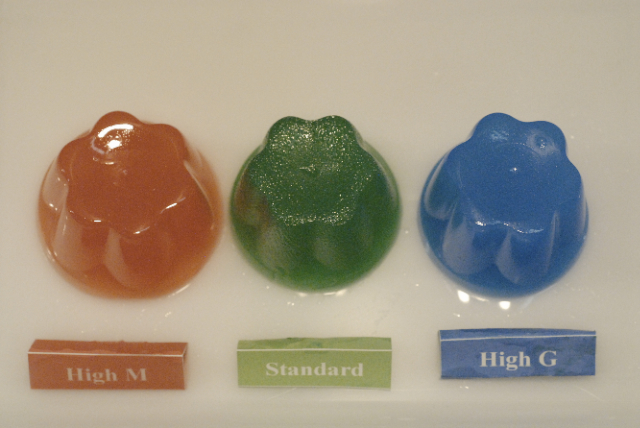 They are chain-forming heteropolysaccharides made up of blocks of mannuronic acid and guluronic acid (picture left shows high manuronic acid gel, standard gel and high guluronic gel, giving different consistencies). Composition of the blocks depends on the species being used for extraction and the part of the thallus from which extraction is made. Extraction procedures probably also affect alginate quality. Alginates of one kind or another seem to be present in most species of brown algae but they occur in exploitable quantities (30-45% dry weight) only in the larger kelps and wracks (Laminariales and Fucales). Not all large brown algae have sufficiently large quantities of alginates to merit exploitation, for example, Sargassum muticum, an adventive species from Japan that has recently arrived in the Atlantic and Mediterranean, has, when dry, only 16-18% alginates. E.C.C. Stanford, a Scottish chemist, discovered alginates from British kelp in the 1880s. The name is based on “alga”. World War II stimulated the alginate industry, when production units were set up in Scotland and California using local seaweed resources of wrack and kelp. After the war other production units then followed suit and were constructed close to natural seaweed beds in Norway, France, Germany, Japan, and, more recently, China. The main raw materials were obtained in California (Macrocystis pyrifera, the Giant Kelp), from the north-eastern Atlantic kelps and wracks (Ascophyllum nodosum, Laminaria hyperborea and L. digitata), and from Durvillaea and other kelps in the southern hemisphere. In China, the kelp Saccharina japonica, introduced from Japan to China in the 1950s and grown on ropes in the Yellow Sea, was used as the main source for the production of crude alginates. Over 2 million wet tonnes of this kelp are grown by mariculture in China; this makes it the single largest maricultural crop in the world by far. Sodium alginate is widely used as a stabilizer or as an emulsifier, or both, and became very popular with the textile printing industry over the years. The fortunes  and misfortunes  of this industry resulted from the ups and downs of the textile industry and changes in textile fashions. Alginates are also the preferred additive to ice-creams and dairy products in many countries, thereby competing with carrageenans in this complex market. Calcium alginate is insoluble in water and this led to the development of fibres that could be woven into various textiles or parts of textiles, and their use in bandages, particularly for large wounds and burns, became widespread. The bandage could be removed much more easily than cellulose-based bandages, as the calcium alginate was soluble in a simple salt solution, and wound disruption was reduced. Modifications of the same principle also allows these fibres to form an important part of firemen’s fire-proof clothing and as part of the fluxes now used in welding rods. Calcium alginate was also used in the manufacture of beads made by dropping a sodium alginate solution into a bath of calcium sulphate solution, forming spheres of water with a calcium alginate coating. These beads are used to immobilize cells or to deliver specific chemicals. 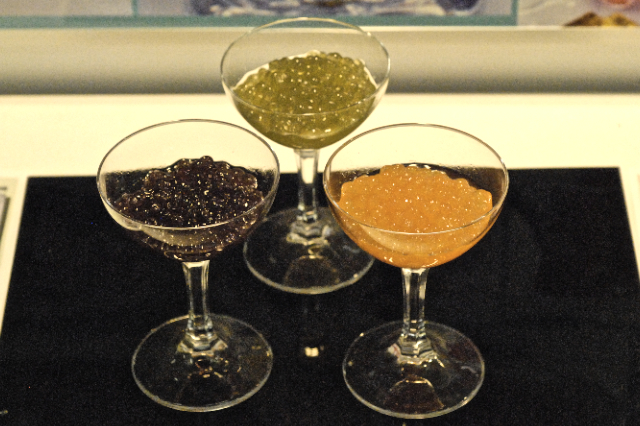 Ever-resourceful Japanese manufacturers have added fish oils and colour to make a range of multicoloured, inexpensive “fish-eggs” (right). Spanish chefs have also used the beads to encapsulate the natural juices of fruits that "explode" on the tongue. In a more mundane application the process is used to make reconstructed fruit in jams using fruit puree bound together in shapes that look and taste like strawberries and blackcurrants. In this instance what you see is definitely not what you get. 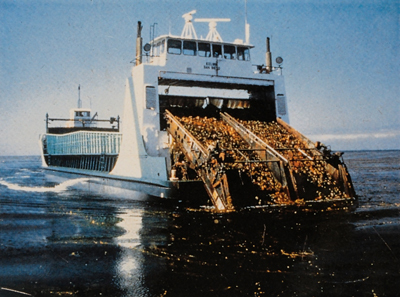 Kelp harvester in California, which was used to harvest the kelp Macrocystis pyrifera for alginate production (© Kelco, Ltd). Such harvesters are now being used to collect kelp for abalone food. 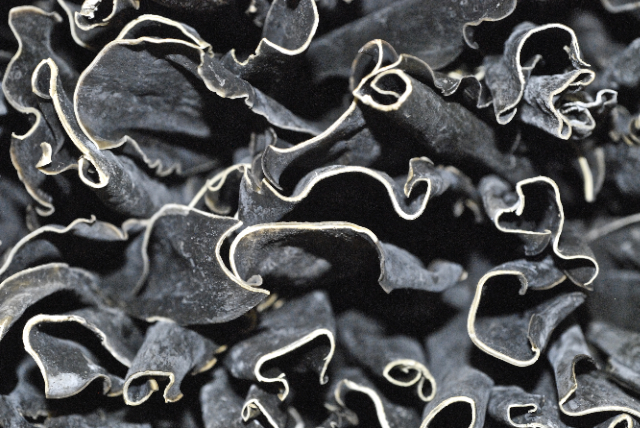 Alginate production has been complicated by the development of local alginate production plants in areas with extensive seaweed resources and relatively low labour costs. This has led to a “shakeout” in the industry worldwide. Some companies have specialised in high-quality alginate production (e.g., Norway), some have specialised in the food, printing and textile areas (Scotland, France), and others have specialised in low-grade production (e.g., China, Chile), whilst yet other companies have specialised in buying low-grade alginates and further refining them. Over the years, this complex situation has led to closures of one factory in Scotland and to the complete cessation of harvesting of Macrocystis in California. 2009 production of alginates was 26,500 tonnes with a value of about US$318 million (Bixler & Porse 2010). China, a relatively recent addition to the alginate manufacturers of the world, is said to produce about 8-10,000 t of alginates from cultivated Laminaria japonica. The main producers are Scotland, Norway, China and the USA, with smaller amounts being produced in Japan, Chile, and France. Ascophyllum nodosum and Laminaria hyperborea are used in Norway and Scotland. About 3,000 dry tonnes (15,000 t wet) of Ascophyllum is sustainably harvested in Ireland to produce seaweed meal that is exported to Scotalnd for alginate extraction. Site © M.D. Guiry 2000 - 2019. Important copyright notice: all text, design and photographs on this site are copyrighted by M.D. Guiry unless otherwise stated and all rights are strictly reserved. Click here for copyright information and contact. Website design: 249 Design Studio. Site maintained by M.D. Guiry (michael.guiry@nuigalway.ie). There have been 8724609 page loads since 1 January 2014 on 22 April 2019.